The Thucydides' trap warns of the danger when a rising power comes into conflict with a ruling one--as Athens and Sparta did in the fifth century B.C. The majority of such conflicts have ended in war. While the 2,500-year-old concept is worth studying, applying it to China-U.S. relations, as some commentators have done, is like modern doctors basing their medical practices on the writings of Erasistratus (304-250 B.C. ), a well-known Greek physician. As Chinese President Xi Jinping said during his visit to the United States, there is no such thing as the so-called Thucydides' trap in modern times. But should major countries time and again make the mistake of strategically misunderstanding each another, they may very well create such traps for themselves. The world today is very different from the time of ancient Greece, and mankind has more wisdom at its disposal to avoid history repeating itself. We have reason to believe that China and the United States face an unprecedented opportunity to break the historical cycle. This is a world where peace, development, cooperation and mutual benefit have become the dominant themes of political discourse in our times. The Cold War mentality and zero-sum-game theory should be abandoned. Despite the persistence of regional conflict, there is no sign of another world war breaking out. More and more countries are choosing to solve their disputes through negotiation. With globalization deepening, one country's loss will definitely not just be its own. "No conflict, no confrontation" will serve as the bottom line for the relationship between the world's two largest economies in the new era. It is important to remember the pledge made 70 years ago by the founders of the UN: "to save succeeding generations from the scourge of war, which twice in our lifetime has brought untold sorrow to mankind." Governments and societies of both countries have reflected on the historical lessons on the 100th anniversary of World War I and the 70th anniversary of the end of World War II (WWII). Hatred and war can bring only disaster and distress, especially when both China and the United States have nuclear weapons. If war erupts, China's development would surely suffer a severe blow, but the United States' leading role in the world would also be weakened. As allies during WWII, the two countries shoulder responsibility to safeguard peace and prevent past tragedies from reoccurring. "It was the rise of Athens and the fear that this inspired in Sparta that made war inevitable," Thucydides wrote. China, however, is not Athens and the United States is not Sparta. It is true that China is rising, but it is a peaceful rise. The country wishes only to bid farewell to its humiliating modern history and realize its dream of national renewal through reform and opening up. As Xi said in his Seattle speech on China-U.S. relations, development remains China's top priority. To people charged with the governance of China, their primary mission is to focus all resources on improving people's living standards and to gradually achieve common prosperity. China sees itself as a member of a global community of common destiny. It does not seek to establish military alliances or engage in hegemonic expansion. There is no cause for fear as China has neither the intent nor the necessity to challenge the United States for leadership by launching a war. Both China and the United States are important members of the Asia-Pacific region, which boasts the world's fastest economic growth and the greatest potential for development. It is also a region of converging interests for both countries. China and the United States are expected to abide by their shared responsibility to maintain peace, stability and prosperity in the Asia Pacific. Economic interdependence alone does not guarantee peace, but it is indeed a strong disincentive against war. It is in America's interest for China to be successful, peaceful and prosperous and vice versa. The two country's $555 billion annual trade volume and $120 billion two-way investment are fundamental to bilateral ties. It is estimated that by 2022, China will have become the world's largest importer and that U.S. exports to China will have surpassed $530 billion, generating more than 3.34 million new jobs. It is the first time in history that an existing power and a rising power have held so many shared interests. China supports the current international system and is a major player in this system. The more developed China becomes, the more it needs a peaceful and stable international environment. So too does the United States. As Xi put it, "If China and the United States cooperate well, they can become a bedrock of global stability and a booster of world peace." China-U.S. cooperation in international and regional affairs is at present expanding, including hot-button issues such as Iranian and Korean nuclear tensions as well as global challenges ranging from climate change and counterterrorism to peacekeeping, poverty reduction and development. Pragmatic cooperation in these areas demonstrates that the two countries can successfully work together to improve global governance. President Xi and President Barack Obama have agreed to promote the China-U.S. relationship. The two leaders have maintained frequent communication and had in-depth exchanges on major issues. Their interaction could ensure that both sides understand each other's strategic intentions and avoid making mistakes on fundamental questions. Xi's visit this year was the third such exchange in the past three years. It showed just how much both sides value this relationship and how willing they are to bolster mutually beneficial cooperation. Forty-four years ago, the visit of a U.S. table tennis team to China opened a new chapter in China-U.S. relations. Now a flight runs between the two countries every 17 minutes. Over the next three years, China will support a total of 50,000 Chinese and American students to study in each other's countries. A focal point of Xi's U.S. visit was his extensive outreach to the American people. His visit will generate a new wave of interest in China and take people-to-people exchanges between the two nations to new heights. Differences in terms of history, culture and social systems as well as in the stages of development the two countries respectively inhabit make it only natural for China and the United States to have divergent opinions, but these do not by any means represent the norm in their ties. Even if there are issues that are at present irresolvable, they can be managed. Over 90 intergovernmental dialogue and cooperation mechanisms have been set up, ensuring that when unhelpful comments or examples of narrow-minded strategic thinking arise, they cannot prevent the two countries from cooperation. The two sides will continue to maintain strategic communication in the areas of the military, open seas, outer space and cyber domains so as to consolidate trust. American leaders have emphasized many times that they welcome a strong, prosperous and stable China playing a bigger role in international and regional affairs. Now it is time for the U.S. side to back up this important statement with concrete actions and follow it earnestly in its interactions with China. 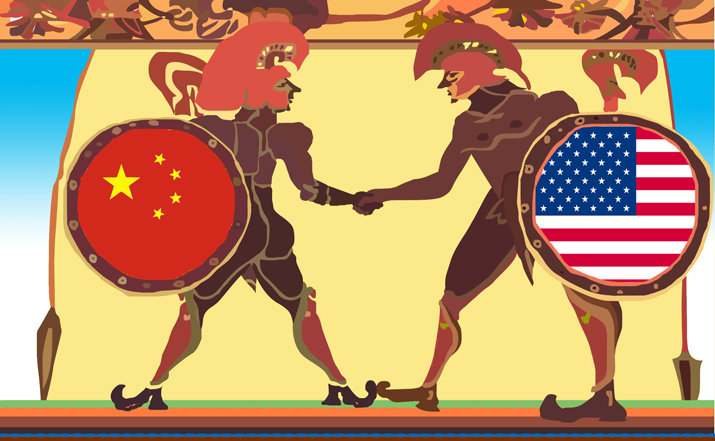 If concerns over the Thucydides' trap are replaced with a commitment to developing a new model of major-country relationship, China and the United States will be able to make a great contribution to the world's future. It is time for the two countries to stand on the same side in order to escape the historical fatalism of confrontation between big powers.